As environmental and conservation efforts increasingly turn towards agricultural landscapes, it is important to understand how land management decisions are made by agricultural producers. While previous studies have explored producer decision-making, many fail to recognize the importance of external structural influences. 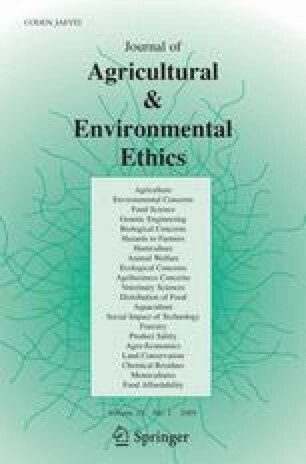 This paper uses a case study to explore how consolidated markets and increasing corporate power in the food system can constrain producer choice and create ethical dilemmas over land management. Crop growers in the Central Coast region of California face conflicting demands regarding environmental quality and industry imposed food safety standards. A mail survey and personal interviews were used to explore growers’ perceptions and actions regarding these demands. Results indicate that in many cases growers face serious ethical dilemmas and feel pressured by large processing and retail firms to adopt measures they find environmentally destructive and unethical. Future strategies to address environmental issues on agricultural landscapes should consider the economic constraints producers face and the role of large firms in creating production standards. CDC. (2006). Center for Disease Control. Multistate outbreak of E. coli O157 infections, November–December 2006. Retrieved June 15, 2007, from http://www.cdc.gov/ecoli/2006/december/121406.htm. CDHS/FDA. (2007). California Department of Health Services and US Food and Drug Administration. Investigation of an Escherichia coli O157:H7 outbreak associated with dole pre-packaged spinach. Retrieved May 18, 2008, from http://www.dhs.ca.gov/fdb/HTML/Food/EnvInvRpt.htm. Gorny, J. R., Giclas, H., Gombas, D., & Means, K. (2006). Commodity specific food safety guidelines for the lettuce and leafy greens supply chain. Retrieved on April 25, 2006, from http://www.cfsan.fda.gov/~acrobat/lettsup.pdf. LGMA. (2008). Leafy Greens Marketing Agreement. Retrieved on June 2, 2008, from http://caleafygreens.ca.gov/members/resources.asp. Lubowski, R., Vesterby, M., Bucholtz, S., Baez, A., & Roberts, M. (2002). Major Uses of Land in the United States, 2002- EIB 14. Economic Research Service. United States Department of Agriculture. Retrieved on April 2, 2008, from www.ers.usda.gov/Publications/EIB14/. Primus Labs. (2008). Ranch Self Audit v. 7.04. Retrieved on July 8, 2008, from http://www.primuslabs.com/psr/fieldfacility.aspx?_Type=1&_MenuID=1. Stuart, D., Shennan, C., & Brown, M. (2006). Food Safety and Environmental Protection on the Central Coast: Exploring the Science behind an Apparent Conflict. The Center for Agroecology and Sustainable Food Systems, University of California Santa Cruz Research Brief #10. Retrieved on July 25, 2008, from http://casfs.ucsc.edu/publications/briefs/index.html. United States Census of Agriculture. (2002). State and County Statistics. Retrieved on January 20, 2007, from http://www.nass.usda.gov/Census_of_Agriculture/index.asp.